In today’s episode, I speak with Gavin Boyter, who recently ran approximately 1172 miles across the UK from John O’Groats to Land’s End. Gavin was an ordinary runner who sought out an extraordinary adventure to see what he was capable of. After being laid off from his job, Gavin used the opportunity of time and severance funds to complete the scenic cross country trip. We walk through Gavin’s backstory, his preparation, his support team, and his journey. A few months back, I was given an advanced preview copy of the book: Downhill From Here: Running From John O’Groats to Land’s End by Gavin Boyter. Gavin is my guest on today’s podcast and has an incredible journey to share with all of us. We often think of challenges like this as something that can only be done by extraordinary freaks of nature. While Gavin’s completion of 1172 miles is extraordinary, Gavin is not a professional athlete or endurance runner. Like many of us, Gavin works a full time job, runs for recreation, runs for health reasons and runs for the pure enjoyment that running provides. 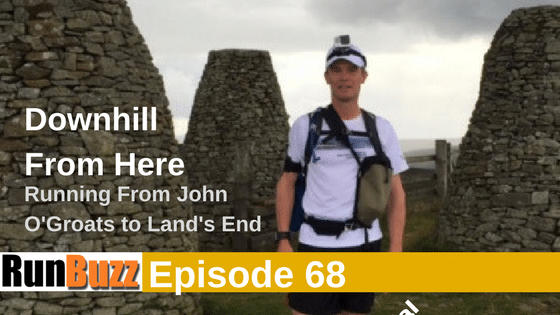 In today’s podcast, Gavin shares an inside view of what it took to prepare himself mentally and physically for this well known, but difficult run across the unforgiving but beautiful landscapes of the UK. We also discuss his journey, his book, and the filming for his upcoming documentary that he is working to get fully funded. If you are looking for a book that has a great story where each day is vividly described, and a great escape that pulls you into his story, then I highly encourage you to check out his book.